Ohio State running back Ezekiel Elliott celebrates after defeating the Oregon Ducks 42-20 in the College Football Playoff National Championship on Monday in Arlington, Texas. The legend of Urban Meyer grows. In coaching the Ohio State Buckeyes to the first ever College Football Playoff Championship on Monday, Meyer not only made college football history, he made statistical history — a history Meyer is uniquely familiar with. After Monday’s 42-20 win over Oregon, Ohio State finished with the second-highest season-ending Elo rating ever (31.7). Only the 1995 Nebraska Cornhuskers had a higher rating (33.4). A little background, in case you’re not familiar: The Elo rating system was originally used for chess, but at FiveThirtyEight we use it to produce weekly NFL ratings, among other things. As my boss Nate Silver has explained, Elo ratings are a simple and transparent approach to numerically rate a team. What makes this Ohio State team stands out is not just its dominance, but its improvement. Here is the season-ending Elo rating for the 3,758 college football team seasons back to 1982 plotted against their change in start-to-finish Elo rating. 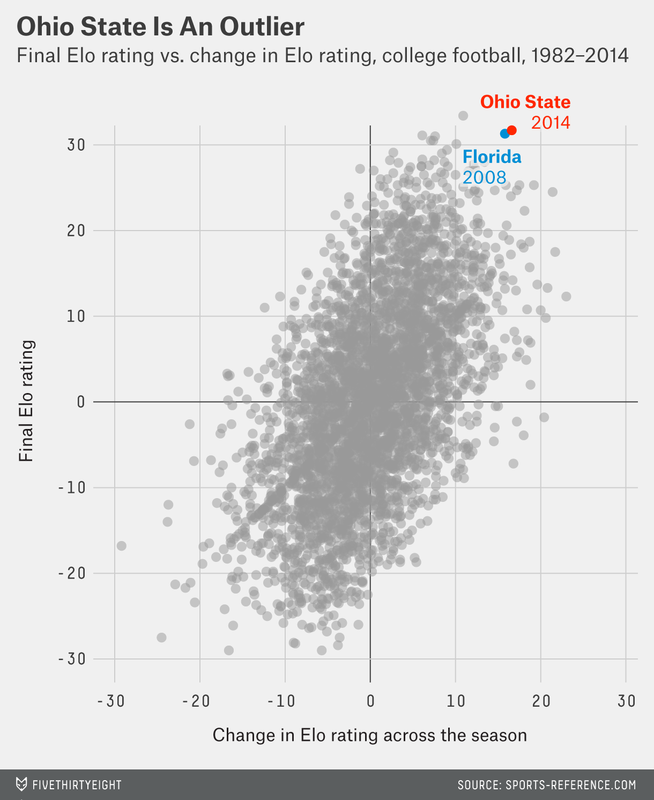 Ohio State is an outlier in both respects. In addition to the No. 2 season-ending Elo rating, the Buckeyes had the 31st most dramatic start-to-finish rating improvement. The team nearest to Ohio State in both dominance and improvement is the 2008 Florida Gators, coached by none other than Urban Meyer.